I only have one thing to say about this photo and that's Jai Ho!! I love this ! great great great!!! Oh I LOOOOOOOOOOOOVE Indian food! Lucky you! Now of course I will have to have an Indian meal pronto! I am a big fan of Indian food too! Explosions of flavors at every bites! This is one of our favorite places. It is always packed with Indians while the next door restaurant has no one! Inexpensive yet mentioned by all the foodies in their blogs. There is one in NYC but the Paris one is even better. And they speak English better than French!! Here in the ever-widening Silicon "Valley," we have many Indian residents. 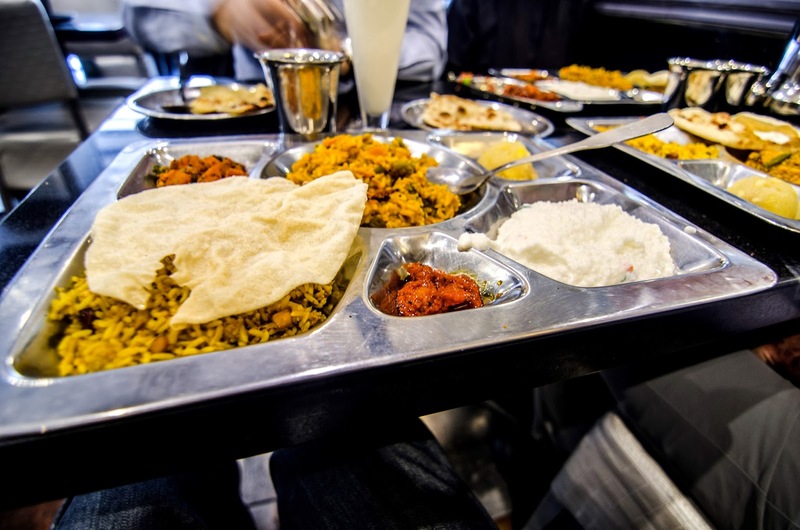 This translates into many Indian restaurants from many different regions in India. Yum! And may I just say that while a sherwani might be over the top, I can see you in a not-too-garishly embroidered kurta. I hear they are very comfortable, too. Thanks for publishing a real veggie meal. Although it's not easy to find a good veggie diner in Paris, Indian and some Moroccan restaurants are really great (didn't know this one). This looks great, thanks for the info! I do get cravings for Indian food in Paris but have yet to venture anywhere to try. As for that meal, it looks deliciously, authentically Indian—worth waiting for. Miam! I am very happy to discover this, very good to know because I end up there all the time, traveling to and from Brussels. I am an Indian and a vegetarian, and naturally, I visit this restaurant often following my grocery shopping in that neighbourhood. Glad that you posted it. I love Mexican,French,Thai as well as Indian food but don't expect in Paris. That is wonderful moment of my life when i find real taste of Indian food in Paris. I remind the name of the street where Saravanaa Bhavan is located and i definitely go to that place with my family next time.